Mary Cooney Alexander, Al Beagan (1941-2010), Lucille Beagan, Michael Beaghen, Adrian Beggan, Gerard Beggan, Judith Biggin, Brian Biggins, Cathi Biggins, Charles Biggins, David Biggins, John Biggins, John Biggins, John S. Biggins, Kathleen Biggins, Kieran Biggins, Mary Hughes Biggins, Michael Biggins, Patrick Biggins, Sean Biggins, Thomas Biggins, Mark Bigham, Martha Bowes, Deirdre Biggins Cameron, Patrick Hogan, John Little, Lori Kaltenbronn, Ann Mahon, Clare McConville, Brid O'Malley, Leo Petrini, Ron Scherer, Monsignor Thomas Shannon (1932-2008), and Ellen Biggins Sullivan contributed to this study. Wanted: Male Beggan/Biggins with Irish, Scottish, or English roots to join the Biggins DNA Project and have his Y-chromosome DNA tested at Family Tree DNA. The Y-DNA67 test is recommended. For information, see Biggins/Beggan DNA. Contact Peter Biggins with any questions. 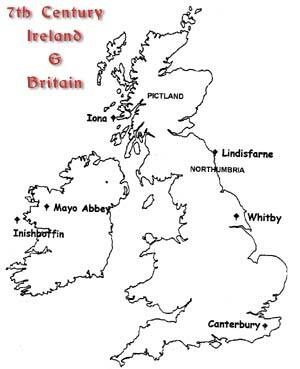 The objective of Biggins/Beggan Irish Roots is to connect Biggins/Beggan descendants in America, Ireland, Scotland, and Australia with their ancestors and cousins. PetersPioneers is a Web site devoted to the ancestors of Peter and Marilyn Carroll Biggins, including Patrick and Bridget Biggins, who immigrated in the 1830s to Will County, Illinois, by way of Ontario, Canada, from counties Mayo, Monaghan, or Cavan in Ireland. This material tends to be oriented to the name Biggins because it is the writer's name, but variations of the name are meant to be included. As children growing up with Irish Catholics in the Chicago area in the 1950s, we were never quite sure we were one of them. My Dad said we were Irish, but the name Biggins just did not sound Irish compared with Murphy, Kelly, O'Connor, Maguire, etc. When you told people your name, they would ask how to spell it, or say it sounded English. Through my whole life, I only met one Biggins who wasn't a relative: John Biggins, an executive with the Elgin Watch Company, whom I caddied for around 1953 when he was a guest at Indian Hill Club in Winnetka. In 2002, I retired and got hooked on genealogy. The first eye-opener was my great great grandfather's first name in the family Bible--Patrick. That sounded real Irish. I found books in the library by MacLysaght and Woulfe that not only listed the name Biggins but said it came from the Irish word beag which, ironically, means small. The U.S. censuse of 1850 said Patrick's wife was Bridget and the two of them were from Ireland. I found two other Biggins families living across the road from Patrick and Bridget. An 1890 biography for one of them said they were from County Monaghan but did not mention Patrick. One of their descendants, Cathi Biggins, said the name was not Biggins originally. My cousin Dan Biggins said we came from County Mayo. In 2006, I started this Web page on Biggins/Beggan Irish Roots and made my first trip to Ireland. I decided to stay in Ballinrobe, County Mayo, because there was a Biggins Bar. I did research there every night. For the first time in my life, everybody knew my name. The Mayo County chairman for the Irish Farmers' Association was Michael Biggins, and he gave me a 2004 book celebrating the 150th anniversary of the Glencorrib National Schools: the name Biggins was practically on every other page. While this page focuses on Biggins families of Irish descent, the name Biggins also is found among families of English descent. There also are descendants of African-American slaves with the name Biggins. In the 1870 United States census, there were 111 households with the surname Biggins. Of these, 44% were Irish, 36% English, and 20% African-American. From Chapter 31, "Fermanagh Families," page 421, in The Fermanagh Story by Rev. Peadar Livingstone, Cumann Seanchais Chlochair, 1969. From page 580 of The Monaghan Story by Rev. Peadar Livingstone, Clogher Historical Society, 1979. Note that Beggan is translated as "a descendant of the diminutive person." In Chapter 5, pages 72-73, Livingstone cites families other than McMahon "who figured in Monaghan in the Middles Ages." He lists those that migrated from Fermanagh to Monaghan in the later Middles Ages: Beggan, McCaffrey, MacManus, Maguire, and Monaghan. The Hearth Money Rolls relate to the years 1663 and 1665. N, W, and C refer to areas of Monaghan: north, west, and central. From The Surnames of Ireland by Edward MacLysaght (1887-1986), Barnes & Noble, Inc., 1969. From Irish Names and Surnames by Rev. Patrick Woulfe, Dublin,1923. Reprinted by Genealogical Publishing Co. in 1967, 1969, 1993. From Irish Names and Surnames by Rev. Patrick Woulfe, Dublin, 1923. Reprinted by Genealogical Publishing Co. in 1967, 1969, 1993. Al Beagan (1941-2010). 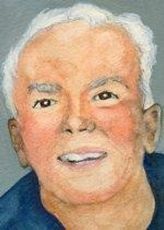 Allen Temple Beagan of Sandwich died July 23, 2010, after a courageous battle with colon cancer at the age of 69. He was the husband of Lucille (Laurie) Beagan for 43 years. Besides his family, Allen's passions were genealogy, softball and gardening. He was a member of the New England Historic Genealogical Society in Boston and a member of the Genealogical Society of Ireland in Dublin. He created his "Genealogy Notes" of Ireland website and spent many hours and years researching his family's history from Ireland to Prince Edward Island, Canada, to Massachusetts. He was a proud member of the Old Timers Softball League out of Harwich and the Sandwich Softball League. It did not take me long to find the "Genealogy Notes" of Ireland, the website of Al Beagan (1941-2010), a history of the Biggins/Beggan/Beagan name. There I found the baptism of Patrick Beggan near the Monaghan border in Drumgill, County Cavan, in 1807, the same year that my Patrick Biggins was born. I also found on Al's site the name of a person in Carrickmacross, County Monaghan, Gerard Beggan, who was interested in Biggins/Beggan genealogy. On my second trip to Ireland in 2007, I met with a Gerard Beggan in Carrickmacross, and he told me he had a professor in college, Peadar Livingstone, who said that Beggans were descendants of Maguires. I met with him again on my third trip. After our son's wedding in Orleans on Caped Cod, Massachusetts, my wife Marilyn and I stopped by unannounced at Al's house in Sandwich on the way home. We were surprised and saddened to learn from his wife Lucille that he had died two months earlier. The gracious Lucille invited us in nevertheless and told us about Al's life and his intense interest in researching his family history and the origin of his Beagan name. Al Beagan's great grandfather was Owen Beagan. For Owen's descendants, see Owen Beagan Family from County Cavan. In 2008, Daniela Moneta started a Biggins DNA project. Daniela is a professional genealogist and started the Biggins DNA project as part of her efforts to learn more about her ancestor Eleanor Biggins who was born in 1798 in Middlesex, England, married Joseph Hewitt in London in 1821, and died in 1859 in Surrey, England. Daniela found this page on the Internet and asked me to have my DNA tested. I was skeptical because of the cost and doubtful that I would learn anything, but my wife Marilyn encouraged me to do it. Now, I really feel Irish--I match up closely with people named Beaghen, Beggan, and Little (John Little's father was nicknamed "Jimmy Beggins"). I match up with Sean Biggins, a descendant of James Biggins who lived across the road from my great great grandfather Patrick Biggins, but the match is not particularly close. Moreover, Biggins/Beggan DNA matches up with Maguire DNA, confirming what Peadar Livingstone had said to Gerard Beggan of Carrickmacross that Beggans are descended from Maguires. Then I learned that ancient histories claim that Maguires are descended from the Three Collas who established the ancient kingdom of Oriel in Northern Ireland. The Maguire and Biggins/Beggan DNA matches fairly closely with other families said to be descended from Clan Colla: McMahon, Carroll, McKenna, McDonald. See DNA of the Three Collas. For the history of the ancient kingdom of Oriel, see the excellent Web site of Jim McMahon. Biggins/Beggan surname variants are found in several DNA projects at Family Tree DNA, which has the largest Y-DNA database in the field. There are two kinds of markers for Y-chromosome DNA: STRs and SNPs. A SNP is a single nucleotide polymorphism, a mutation in the DNA that happens when a single nucleotide (A, T, G, or C) in the genome sequence is altered. A person has many SNPs that together create a unique DNA pattern for that individual. An STR is a Short Tandem Repeat, or count of repeats at a physical location on the chromosome. These repeats can be used to predict STRs. They can be used to create a modal DNA for a group of men that match each other. And they can be used to measure genetic distance between two testers and between a tester and the modal DNA. STR testing is done by everyone who tests with FTDNA. SNP testing is newer and is done by a much smaller group. Following are the participants in the Biggins DNA project and the Bingham DNA project who have tested 67 STR markers. All have the L21 SNP, which is considered a Celtic SNP. There are three groups. The first two are descended from Clan Colla and have the Z3000 SNP. The third is said to be descended from Niall of the Nine Hostages and has the M222 SNP, and probably the DF105 SNP. The M222 group also is known as Northwest Irish. Gerard Beggan 166169 413b=24 Beggan, Clones, Ireland Remained in Ireland. Originally from Clones near the Fermanagh/Monaghan border. Died in Carrickmacross, County Monaghan, in 2018. David Biggins 125892 Henry Biggins, 1859, Yorkshire, England David's ancestor was from Yorkshire, England, but possibly may have immigrated from Ireland. Charles James Biggins III 256505 Patrick Biggins, 1807, Cloondaver, Robeen Parish, County Mayo Chuck's great great grandfather, James Biggins, emigrated in 1851 to Livingston County, New York, then in 1854 to McKean County, Pennsylvania. Before Cloondaver, the family lived in Roundfort, which is east of Ballinrobe and south of Hollymount. Before that, the family was from around Glencorrib in far south County Mayo. Big Y SNPs. SNPs (e.g., BY3164) are single nucleotide polymorphisms, or mutations, found on the Y chromosome. SNPs that are inherited by two or more testers allow the creation of tree branches with named SNPs. BIG Y is a testing program offered by Family Tree DNA since 2014 that identifies SNPs on a large portion of the Y-chromosome. Three men in the first group have done Big Y so far and all share a SNP named BY3164 that no one else has. BY3164 has been traced back to Colla Uais. Following is a list of SNOPs leading up to BY3164, together with a very very rough estimate of the year when each SNP occurred. Clcik on the SNP to see the basis for the estimated year. ZZ2/BY516. Year 503. Descendants with this SNP other than Biggins/Beggan include McDonalds who trace their Y-DNA ancestry back to Somerled. See Detailed Clan Colla BIG Y tree and Summary Clan Colla BIG Y tree. Unique STRs. There is one STR marker that so far is the same for all Bigginses in the first group. It is not found in any other Clan Colla descendants. That marker is 413b. The value for all Biggins testers is 24. No other Colla descendants have a value of 24. Instead they have a value of 23, except for a few who have 22. The table on the right shows the genetic distances, in 67-marker STRs, among the testers in the three Biggins groups. The distances among the ten Biggins testers in the first group range from 2 to 12, and the average is 6, which indicates that they are related but not closely related. The genetic distances of the Little in the second group relative to the first group range from 9 to 15, indicating that there are many more generations between the two groups. In fact, he matches up with a Smith group. The distance between the first two Biggins in the third group is 0, which indicates that they are very closely related. The distances of the Biggins in the third group relative to the first two groups range from 21 to 26, indicating a large number of generations between the third and the first two groups. This distance is relective of the difference between the Colla/DF21 SNP and the Niall/M222 SNP. The distance between the first two and the third Biggins in the third group is 11, which indicates that they are not closely related. Genetic distance occurs because of mutations from one generation to another. If two people are identical in all STR markers except they are off in one marker by 1 point, the genetic distance would be 1. If they were off at 2 different markers by 1 point in each marker, then the genetic distance of those two samples would be 2. If they are off by 2 points at one marker and 1 point in a second marker, then the genetic distance would be 3. Based on FTDNA practice, as modified in 2011, the genetic difference for some markers is limited to 1. This method of computing genetic distance is called the hybrid mutation model. By testing the Y-DNA, males can determine the origin of their paternal line. Note that the Y-DNA strictly checks the paternal line, with no influence of any females along that line. Females do not receive the Y-chromosome, and therefore females cannot be tested for the paternal line. If you are a female and would like to know about your paternal line, you would need to have a brother or a male relative from that line to be tested. By testing the mtDNA, males and females can determine the origin of their maternal line. Note that the mtDNA strictly checks the maternal line, with no influence of any males along that line. Both males and females receive the mtDNA from the mother. If you decide to participate, FTDNA sends you two scrapers that you use to swab the inside of your cheek. They give you a homepage for your DNA results and genealogical information. DNA results are posted there and on a public page that compares your DNA with others in the project. Are you related to other people with the same name? I was able to learn that there is a close relationship between Patrick Biggins, my great great grandfather, and James Biggins who lived across the road from Patrick in Will County, Illinois. The DNA of Sean Biggins, a descendant of James Biggins who lived across the road, confirms that there is a relationship. An 1890 biography of James Biggins says he came from County Monaghan. Now I have reason to believe that my Patrick came from Monaghan. Are you related to people with the same name in other parts of the world, such as County Mayo, Scotland, and England? For example, if you are a Biggins from County Mayo, are you related to people with the same or similar name in County Fermanagh? We have oneparticipant from County Mayo, none from Scotland. We have a particpant from England. Are people with English roots named Biggins related to people with Irish roots named Biggins? The one person named Biggins with English roots has a genetic distance of 11 from the one from County Mayo. Their Y-DNA matches the DNA of Niall of the Nine Hostages. Are people with variants of Biggins/Beggan related? 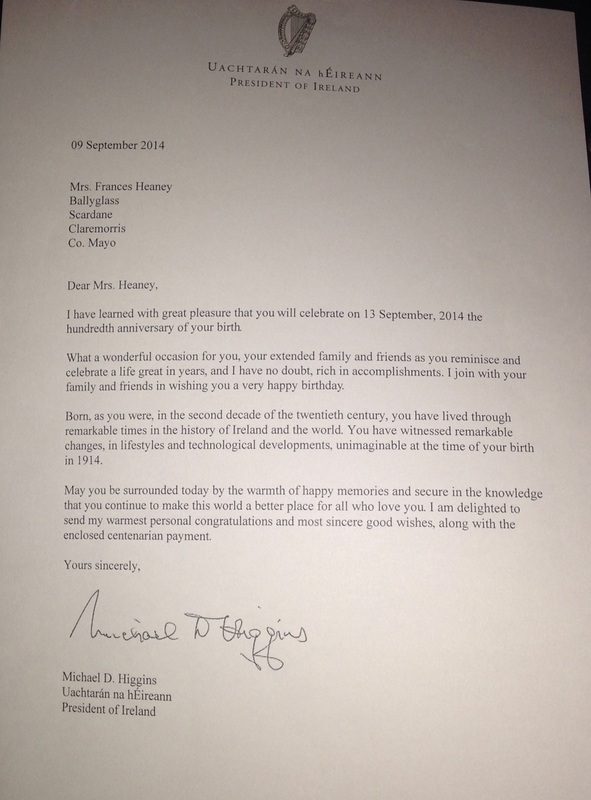 Michael Beaghen, whose ancestors came from County Monaghan, is closely related to us. We have two Bighams who are closely related. The Griffiths Valuation shows a number of people named Bigham from County Down. Are people named Little related to people named Biggins/Beggan? John Little whose family name was Beggins matches closely with my DNA. The Irish beag means small. John lives in Perth, Western Australia, but was born and raised in Ayrshire, Scotland, and previously lived in Canada fourteen years. His father was James Little, known as a child as Jimmy Beggins. He was born in 1898 in the townland of Drumlane in the Parish of Laragh, County Cavan. His grandfather was James Little, born in 1860, and his great grandfather was Bernard Little born circa 1813, who acquired the farm in Drumlane through marriage. Are you descended from Clan Colla? There is a theory that people named Beggan were a branch of the Maguire clan that were small in stature. See "Peadar Livingstone's Theory" below. I found that there are people named Maguire, McMahon, Carroll, McKenna, McDonald, and McDaniel who match fairly closely with my Y-DNA. People with these names are said to be descended from the Three Collas, who established the ancient kingdom of Oriel. To sign up for the Biggins DNA Project, go to this Web page: Biggins DNA project. I strongly recommend the 67-marker test. For a table of the current participants and their Y-DNA results, go to Biggins DNA project. The Irish word for little or small is beag. According to exerpts from the works of Edward MacLysaght and Rev. Patrick Woulfe, this is the origin of the name Biggins. In 1834, John O'Donovan (1806 to 1861) traveled throughout Ireland gathering information for the Ordinance Survey of Ireland about antiquities and notable families and places. He gathered his comments in a series of letters. In one of these letters, O'Donovan lists 26 "aboriginal families of Clones and its vicinity" according to "Con O'Neill, who is intimately connected with the country." The 16th family is "O'Becan, now translated Little." In his 1993 book containing O'Donovan's letters from Fermanagh, John Cunningham comments that "Beggan or Little is a common name in the Clones, Rosslea, Donagh area. It is a British name as well as being the anglicized version of an Irish name." See: John O'Donovan's Letters from County Fermanagh (1834), by John O'Donovan, edited by John B. Cunningham, 1993: letter from Enniskillen, November 24, 1834, pages 74-81. Biggins is a relatively rare name. As far as we know, there never really was a Biggins clan, chieftan, or coat of arms. In his 1969 book, The Fermanagh Story, Rev. Peadar Livingstone includes a list of the prominent families of Gaelic origin. One of these is Beggan. In 2007 and again in 2009, I met with Gerard Beggan in Carrickmacross, County Monaghan. Gerard's Beggan ancestors came from the Clones-Roslea area. As a young man, Gerard was working in a hotel in Clones in 1969, the year that The Fermanagh Story was published, There he met Father Livingstone, who told him that the Beggan family was originally a branch of the Maguire family. Maguire is the most common name in Fermanagh. The Clan Colla Big Y SNP Tree shows a common Biggins/McGuire/McDonald ancestor with the BY516 SNP (mutation), which goes back very roughly to the year 1000 AD. 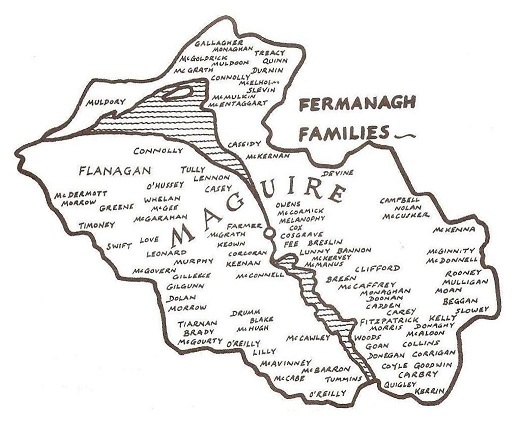 1969 map of surnames in County Fermanagh from Chapter 31, "Fermanagh Families," in The Fermanagh Story by Rev. Peadar Livingstone, Cumann Seanchais Chlochair, 1969. Note the name Beggan on the border in the lower right quadrant of the map, which is the Clones area. 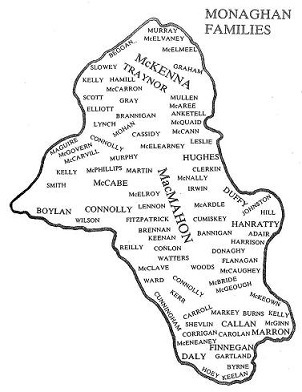 1979 map of surnames in County Monaghan from page 51 of The Monaghan Story by Rev. Peadar Livingstone, Clogher Historical Society, 1979. Note the name Beggan in the upper left quadrant of the map, which is the Clones area. A biography of Peadar Livingstone says Father Livingstone was a renowned scholar in both the Irish language and local history. He wrote comprenensive histories of two counties in Ireland: The Fermanagh Story (1969) and The Monaghan Story (1979). He also wrote a regular column for the The Fermanagh Herald, a local newspaper, under the name "Ernesense." Peadar Livingstone was born in 1932 and lived in the town of Castleblayney in County Monaghan. His father was a jeweller. He entered St. Macartan's College in Monaghan in 1945. Following his secondary school education, he entered Maynooth College to study for the priesthood for the diocese. He studied Celtic languages--Irish and Welsh--and theology. He was ordained a priest in 1957. Father Livingstone entered University College Dublin to continue his studies in Irish; however, he was recalled to the diocese before he completed his studies. He was appointed to the teaching staff of St. Michael's College in Enniskillen, a diocesan seminary in Northern Ireland, where he served as President and taught Irish, history, and religion. He was appointed a curate to the parish of Donaghmoynero in 1977. In 1987 he was assigned to the parish of Clogher in County Tyrone where he died later that year at age 55. John O'Hart's Irish Pedigrees, Fifth Edition, 1892, Volume I, page 453 gives the pedigree of Bec, son of Cuanach and King of Orgiall, from whom descended Cineal Beice. Fiachra Tort ("tort" or "toirt:" Irish, a cake, a little loaf, bulk): son of Colla Uais; a quo O'Tuirtre; and a quo the territory of Tuirtre, more lately known as Northern Clanaboy, now the baronies of "Toome" and "Antrim." Eachin (meaning "a little horse"): his son; a quo O'Eakin and Eakins; had six brothers—1. Muireadach, 2. Cormac, 3. Main, 4. Laeghaire, 5. Aongus, 6. Nathi. Fedhlim: son of Eachin; had five brothers. Cuanach: his son; was King of Orgiall, as were also seven of his posterity. Bec: his son; King of Orgiall; a quo Cineal Beice. This pedigree also appears in The Laud Genealogies and Tribal Histories 610 (c.1000), Rawlinson B.502 (c.1120), Book of Ballymote (c.1400) and the Book of Lecan (c. 1400). John O'Hart's Irish Pedigrees, page 819, says that among the territories possessed by Chiefs and Clans of Ulidia in the twelfth century, as collected from O'Dugan's Topography, are those of O'Flinn, and O'Domhnallain or O'Donnellan, chiefs of Hy-Tuirtre: a people seated on the east side of the river Bann and Lough Neagh in Antrim; and descended from Fiachra Tort, grandson of King Colla Uais. Hy-Tuirtre comprised the baronies of Toome and Antrim, and was afterwards known as northern Clanaboy. slew Aedh, son of Ainmire. and the side of Aedh, son of Ainmire." The table below has been taken from the Griffith's Valuation property survey of 1848-64. Some people named Bigham and Little may be Anglo-Irish rather than Irish with an anglicized name. Saint Bécán, one of the Twelve Apostles of Ireland, founded a monastery in Kilbeggan in the 6th century, giving rise to the town's Irish name Cill Bheagáin, meaning "the church of St Bécán". Kilbeggan Parish is in the Diocese of Meath. Claire McConville has a website, Claire's Ancesttry, in which she provides the ancestry of her great great great grandparents, the Patrick and Catherine McElroy Beggan from Corraleek, Roslea, County Fermanagh. In his "Genealogy Notes" of Ireland website, Al Beagan (1941-2010), includes his Beagan pedigree. This webiste is discussed more fully at Al Beagan's "Genealogy Notes" of Ireland. Owen Beagan was born in County Cavan in 1827. He emigrated in 1839 to Newfoundland and in 1842 to Prince Edward Island. He was a farmer and school teacher. Owen married Ann Trainor in 1857 in St. Patrick's Church in Fort Augustus, PEI. Ann Trainor was born in 1840 in County Monaghan. Owen's father, John Beagan, was born about 1800 and is thought to be from Kilsherdeny Parish in County Cavan. Helen M. Beagan b. 1926 m. 1944 Myron Chaberlain Jr.
Deborah McGinley b. 1940 m. Leroy Campbell Smith Jr.
Biggins Konnections is the website of David Belfry Biggins that provides the family history of Mathew Biggins who was born in 1835 in County Cavan. David received research support from his cousin and Leslie Biggins Winter, who visited us with her husband Cort in April 2015. In 1837, Mathew Biggins emigrated at age 2 from County Cavan to Philadelphia, Pennsylvania, with his father Thomas Biggin. He enlisted in the Army in 1861 and was injured in the Battle of Gettysburg in 1864. He met his wife while he was recovering from his injury in the hospital at Chestnut Hill, Pennsylvania. In 1868, Mathew and Deborah moved out West and in 1874 settled in the Dakota Territory. Anne Bentsen has compiled a family tree for the Biggins family of County Cavan and Springfield, Ohio, at in her Burgstaller Family History. The family tree consistes of four Biggins siblings: Anna, Patrick, Charles, and Owen. They were all born in Ireland. The fourth, Owen Biigins, is known to have been born in Ballieboro, County Cavan. Bailieborough, or Bailieboro, is a medium-sized town in the townland of Tanderagee, County Cavan. St. Anne's Church in Bailieboro was buiilt in 1834 and is part of Killann Parish in the Diocese of Kilmore. All four emigrated to Springfield, Ohio. Owen Biggins is known to have emigrated to New Orleans in 1849, then to Springfield. Kieran Biggins became part of the Biggins DNA Project in 2017. His paternal ancestry is summarized as follows. James Biggins 1811-1856. b. in Cootehill, Co. Monaghan. m. 1836 Agnes Woods in Paisley, Scotland. d. in Annick Lodge Colliery, Ayrshire. Mary Biggins 1843-1919 m. 1864 James Burns (or Byrne). John Biggins 1852-1884. Emigrated 1873 to South Dakota. Known as "Scotty Biggs." Hugh Biggins 1859-1931 m. Bridget McCann. After Bridget died, Hugh emigrated in 1927 to Chicago, Illionois. On my 2006 Trip to Ballinrobe, I visited Thomas J. Biggins and his wife Grace in Castlecarra, County Mayo, Ireland. Thomas' great great grandfather Patrick was from the townland of Cloondaver in Robeen parish. Before that the family lived in Roundfort, which is east of Ballinrobe and south of Hollymount. Before that, the family was from around Glencorrib in far south Co. Mayo. I was the second Biggins from America to visit Thomas and Grace. The first was Brian Biggins of Hermitage, Pennsylvania, who visited them ten years earlier. In February 2010, Brian's cousin Leo Petrini provided additional information. In October 2007, Mary Hughes Biggins, wife of Thomas Biggins' brother John, found this page while researching her husband's ancestry. In January 2009, she was able to make significant contributions to the tree below. In August 2009, Charles James "Chuck" Biggins III found this page on the Internet and sent an email with updates. In September 2012, he joined the Biggins/Beggan DNA project. He was the first Biggins with Mayo roots to join the project. He has the DNA of Niall of the Nine Hostages, also called Northwest Irish. In December 2018, Joe Biggins sent me an email about Gerald and Aidan Biggins, who had emigrated to Chicago: "I stumbled across your website the other day, and I just wanted to comment on how awesome I thought it was. My father, Joseph Biggins, passed away two years ago. I was too young to get to ask him a lot of questions about my family history, unfortunately. I noticed my Grandfather, Gerald Biggins, and my great-uncle, Aidan, are included in your trees. I never met my grandpa cause he passed away in 1987 before I was born. However, I did know Aidan. He lived with my Grandma, Ann Flannery. She was also an Irish immigrant. She recently passed away this passed winter. I just wanted to say thank you for everything you have done. It helps a kid like me really know where he came from after losing everyone that knew themselves." Joe's father's obituary in the Chicago Tribune, Jan. 22, 2016: "Joseph G. Biggins, age 60, beloved husband of Lucille G., nee Platt; loving father of Joseph, Jacqueline, Jennifer and Julie; cherished son Anne, nee Flannery and the late Gerard; dear brother, brother-in-law and uncle of many." On my 2006 Trip to Ballinrobe, I stayed at Riverside House, a very nice B&B on Cornmarket Street. It is run by Anne Mahon. Anne and her family had lived in Staten Island and New Jersey for a number of years before returning to Ballinrobe. When I arrived at Riverside House, I told Anne that I was researching Biggins genealogy. To my surprise, she told me her aunt Katie Grimes married Thomas Biggins in Glencorrib. By the time I left, she was able to give me details of this Biggins family, which I posted on this Web site. 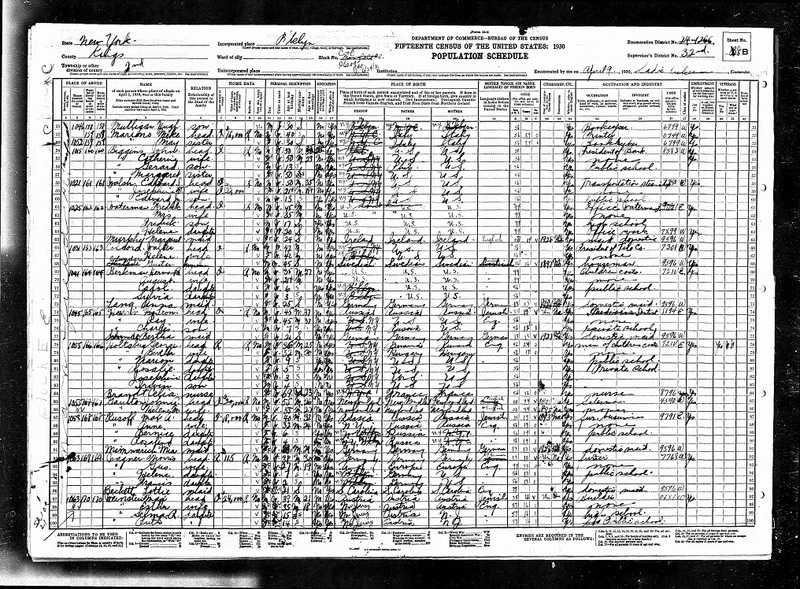 It subsequently was seen by several relatives who were "Googling" their ancestors: Kathleen Biggins in The Bronx, New York, Helen Sullivan Peters and her mother Ellen Biggins Sullivan in Monroe, New York, Lorraine Biggins in Medford, Massachusetts, and Mary Cooney Alexander in Basildon, Essex, England. These four, especially Mary Alexander, added greatly to the family tree shown below. Sister M. Amatus Biggins. One member of the Biggins family from The Neale and Ballynalty was Ellen Biggins (1903-1972). She emigrated with 7 other women in 1929 to Villa de Matel, Houston, Texas, to join the Sisters of Charity. She became Sister M. Amatus and served in hospitals and orphanages in California, Texas, and Louisiana. Her ancestors were from County Mayo, Ireland. She is the daughter of Thomas and Mary Biggins Biggins from Turloughmore, The Neale, then in Cushlough (Lough Mask road), Ballinrobe. Her parents were first cousins. 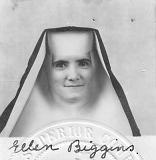 Sister M. Amatus (Ellen Biggins), circa 1929. 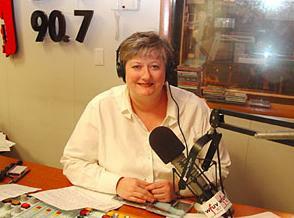 Kathleen Biggins, host of A Thousand Welcomes on WFUV FM Saturday mornings from Fordham University. My father's parents both came to the U.S. from Ballinrobe, Co. Mayo in the 1920s, so I'm second-generation American. There are no Biggins relatives of mine left there (there's another Biggins family in the town, but they're not related that we know of). My grandmother's relatives are still in the town, though. Most of the other Biggins relatives are in The Neale. I don't know of any Biggins geneolgists in Ireland, so I can't really help you there. But Mayo is a good place to start. It's really the only place in Ireland where you'll find the name. Hazen Paper v. Biggins. In 1993, the Supreme Court of the United States reviewed an age discrimination case involving Walter F. Biggins (Hazen Paper v. Biggins, 507 U.S. 604). Justice Sandra Day O'Connor delivered the unanimous opinion of the Court. Justice Anthony M. Kennedy filed a concurring opinion, in which Chief Justice William H. Rehnquist and Justice Clarence Thomas joined. Other Justices were John Paul Stevens, Byron White, Antonin Scalia, Harry Blackmun, and David Souter. Hazen Paper Company manufactures coated, laminated, and printed paper and paperboard in Holyoke, Massachusetts. Hazen hired Walter as their technical director in 1977. They fired him in 1986, when he was 62 years old, just before he would have vested under the Hazen pension plan. Walter is the great grandson of Patrick and Honor Thornton Biggins from the Neale. He is the grandson son of Thomas and Annie Crosby Biggins who emigrated in 1889 to Chelsea, Massachusetts. He is the son of Thomas and Ella Biggins. Family Tree. A family tree for the Biggins family from The Neale and Ballynalty is shown below. Thomas Biggins married in 1881 to Bridget Walsh of Ballycusheen, Kilmaine b. 1850. They lived in Ballynalty (Thomas, Bridget, and children listed in 1901 Census for Ballynalty; Bridget and children listed in 1911 Census for Ballynalty). Bridget Biggins 1864-1894, married in 1891 to Thomas Barrett 1866-1930 in Chelsea, Massachusetts. Went to the US after being refused a teaching post in The Neale because of political differences. Sarah Biggins 1875-1941, married 1900 James O'Malley 1876-1943, lived in Creevagh, The Neale. Sarah O'Malley 1912-2009, emigrated to Lancashire, England, married Patrick Cooney 1913-1947 and had three children, then Robert Burns 1913-1992 and had two children. Mother of Mary Alexander, who provided much of the information on this tree. John Joseph Biggins 1894-1970. A son had a daughter who had a son whose DNA matches Mary Alexander (see 1st column), based on Family Tree DNA Family Finder. He is Mary's 3rd cousin twice removed. Biggins Bar, Ballinrobe. 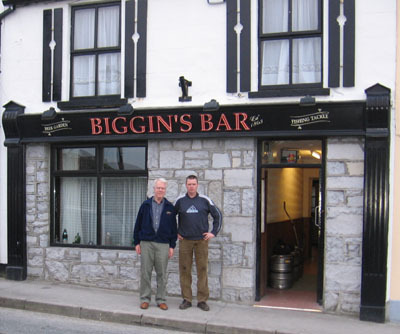 Research prior to my 2006 Trip to Ballinrobe indicated that there was a Biggins Bar in Ballinrobe. The existence of this establishment was a major reason for selecting Ballinrobe as a base for Biggins family research. Biggins Bar is on Bowgate Street, which is an informal section at the south end of Main Street. The first night I went to Biggins Bar and introduced himself to John Biggins, the proprietor. I also met a first cousin of John Biggins, known as John Joe Biggins, who had returned not long ago from working in Dublin at The Stephen's Green Hibernian Club, founded in 1840 by Daniel O'Connell and others. My brother Jim had coincidentally gotten John Joe's phone number from staff at the club, when he and his wife Anne stayed there a year earlier. I did research at Biggins Bar every night for six nights, enjoying a couple pints of Guinness each night. I was able to verify what my brother Bill had always told me, that Guinness tastes best in Ireland. Bill had traveled to Co. Mayo following his discharge from the Navy during the Viet Nam conflict. Biggins Bar is a favorite place to purchase flies for fly fishing. John's father Sean was an avid fly fisherman. After his father's death in a car accident in 2003, John established the Sean Biggins Memorial Cup for the best Ballinrobe angler in the annual World Cup Trout Fly Angling Championship at Lough Mask, a few miles west of Ballinrobe. Established 1863. John Biggins says that Biggins Bar is the oldest continuously operating bar in Ballinrobe. As indicated on the sign, it was established in 1863. It originally was in the Farragher family. The first Biggins proprietor was John Biggins, grandfather of the current owner, who married Mary Farragher. According to a 1987 guide to the history and folklore of Ballinrobe, Itchy Feet & Thirsty Work, by Bridie Mulloy, Biggins Bar "is possibly the oldest license in town. The license was originally for a house in Brewery lane - off Bridge Street - but through the goodwill of Colonel Knox, for whom Sean's maternal great grandfather was gardener, a house was leased in Bowgate Street which still prospers." Biggins Bar on Bowgate Street, Ballinrobe, Co. Mayo, Ireland, 2006. Just after the name on the sign, it says "Est. 1863." The left side of the sign says "Beer Garden." The right side says "Fishing Tackle." From left: Peter Biggins, researcher, and John Biggins, proprietor. Deirdre Biggins drapery shop on Chapel Street in Ballinrobe, Co. Mayo, Ireland, 2006. Sign in widow announces "Wedding Feathers - Now in Stock." D. Biggins, Ballinrobe. On my 2006 Trip to Ballinrobe, I went to the drapery shop of Deirdre Biggins Cameron (ladies' and children's wear) on Chapel Street in Ballinrobe. Deirdre is a sister of John Biggins of Biggins Bar. This Biggins family originally came from Rostaff, which is in Co. Mayo on the Galway border. 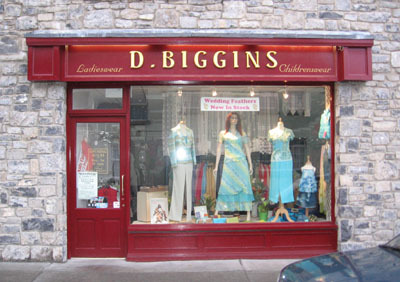 Deirdre's grandfather, John Biggins moved to Ballinrobe and opened a drapery shop. My sister Emily and her husband Jack visited the John Biggins shop in 1971 and spoke with his wife Mary. Her husband John had died in 1962. Cyril Biggins, Ballinafad, Connemara. In 2011, our friend Marie Whitla O'Reilly was visiting Connemara and happened upon a fishing guide named Cyril Biggins at Ballynahinch Castle Hotel. I sent an inquiry to the Hotel and received an email back from Cyril's wife Brid O'Malley who told me Cyril was a cousin of John Biggins of Biggins Bar. 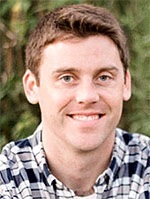 He is the son of Liam and Josie Carney Biggins and brother of John Joe Biggins and Celine Biggins. "Cyril works as a fishing guide and instructor here at Ballynahinch Castle Hotel, where I also work, in administration. I will attach a couple of photographs and you can check out if you think he looks like any of the other Biggins!! He is a complete Carney, I think." Sadly, Brid also told me that Cyril's brother John Joe and their mother Josie had died unexpectedly in February two weeks apart. Ballynahinch has long been famous for its fishing guides and the tradition has continued in the same families from generation to generation. Photographs in the hotel of fishing guides from the 1800’s confirm this long-standing practice. Fishing guides teach the inexperienced angler and direct the more practised angler to where the big fish are. Fishing at Ballynahinch is by fly only. Ballynahinch Castle Hotel is set in a private 450 acre estate of woodland, rivers, and walks in the heart of Connemara, Co. Galway. The hotel overlooks its famous salmon fishery, with a backdrop of the Twelve Bens mountain range. 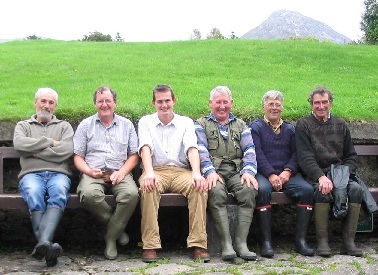 Fishing guides at Ballynahinch Castle Hotel. Cyril Biggins is second from the left. John D. Biggins, Sheffield, England. On March 4, 2014, there was an article entitled "Startling Video Explained" by James Gorman in the Science section of the New York Times. It was about "beads leaping out of a jar in an arc before falling to the floor." The article mentioned John S. Biggins, a Cambridge physicist. I sent John an email and found out that his grandfather was Patrick Biggins (1925-2006) from Ballinrobe, who had emigrated to England. His father was John D. Biggins, a Professor of Mathematics at the University of Sheffield and a Deacon in the Catholic Church of St. William of York. Being a church webmaster, I went to the parish website and found a series of beautiful homilies by John Biggins. Another son of John D. Biggins is Mark Biggins, who is a conductor, pianist, and singer. He is currently a student at the Royal College of Music in London, England. Mark holds degrees in Musicology from Cambridge and Music Theory from Yale University. 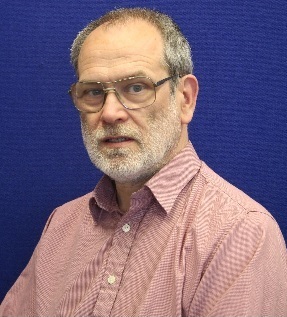 John D. Biggins, Professor of Mathematics, The University of Sheffield. John S. Biggins, Research Fellow, Trinity Hall, Cambridge University. 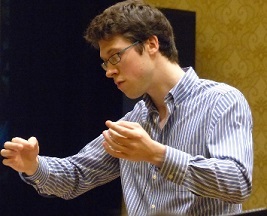 Mark Biggins, who is a conductor, pianist, and singer. He is currently a student at the Royal College of Music. In March 2015, Anna Biggins offered some additional information on the Biggins family from Sheffield. "I came across your website today and found the photos of my dad and brothers. Just thought I'd let you know that there's also three sisters - my eldest sister Ruth (b.1982), Elizabeth (b.1993) and myself Anna (b.1996). 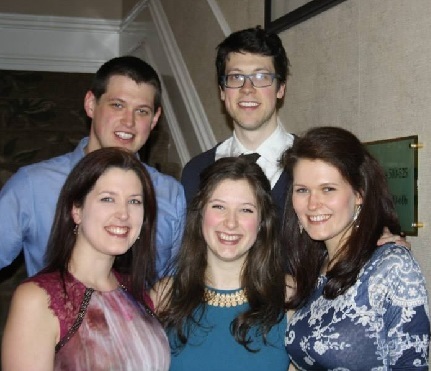 Ruth married Graham Tebbutt in 2006 and they have two children Emma and Luke. She's a language teacher. Elizabeth (Lizzy) graduated in Psychology. I am studying medicine." The Biggins siblings of Sheffield, England. Family Tree. The family tree of the Biggins family from Ballinrobe and Rostaff is shown below. On my 2006 Trip to Ballinrobe, I visited with Michael and Bridie Murphy Biggins on their cattle/sheep farm in the townland of Ballynalty, which is 8 miles south of Ballinrobe, near Glencorrib. Ballynalty is just north of the Black River, which separates Co. Mayo from Co. Galway on the south. The post office for Ballynalty is Headford, which is in Co. Galway. 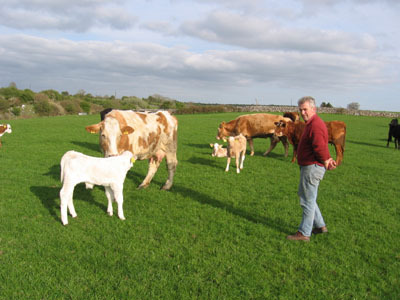 Michael Biggins with cattle on his farm in Ballynalty, Co. Mayo, Ireland, 2006. Michael was Mayo County chairman for the The Irish Farmers' Association from 2002 to 2008. Michael and Bridie have five children. The farm has been in his family for hundreds of years. Michael took me over to his mother's house for a visit. Her name is Norah and her maiden name was Biggins. Norah has a brother John Biggins in Boston. Her husband, Thomas Biggins, died in 2003 at the age of 82. I was served tea at Norah's house and then dinner at Michael's house. Following that, Michael took me on a tour of the farm and down to Headford to see his son who was working at the cattle sale. Michael referred me to Eamon Martin who is doing genealogical research. Eamon, who is married to Frances Biggins and lives in Dublin, has provided some interesting information on Peeter Beaghan in the 1650s. Peeter who was given 673 acres of land in Co. Mayo to partially replace land confiscated in Co. Monaghan. Cromwell confiscated land owned by Catholics east of the river Shannon to compensate soldiers who helped put down a rebellion in 1641 and to reduce the influence of Catholics east of the River Shannon. Peeter's new land consisted of seven parcels in Shrule (Muckallgee, Balynalta, Carrownaheele) and Mooragagh (Killinebringe, Carrowmore). This information is included in the Book of Survey and Distribution on Martin Ryan's Shrule Web site. Peeter also received land back in Co. Monaghan. One explanation may be that he bought land from soldiers who had received it. Michael also referred me to his niece Kathy Keane who is doing genealogical research. She has emailed me a family tree that allowed me to create a Biggins descendants chart for Michael's great great grandfathers on both his mother's and father's sides. Michael's parent are in italics on both sides of the chart. In 2013, Lori Kaltenbronn sent an email and provided valuable information for the chart below. She is a great granddaughter of Mary E. Biggins and Thomas Luke Martin from Tuam. Family legend is that they met on the ship when emigrating. They came to the America about 1885 and settled in St. Louis. Her brothers James and John also lived here. When James died he left money to Bridget Murphy and Denis Biggins of Ireland in his estate. They were identified as his sister and brother. I'm not sure what happened to John. He wasn't listed in his brothers estate like the other siblings. Lori also has some relationship to descendants of John Biggins and Katherine (Kitty) Sheridan. Their son Michael J Biggins came to St. Louis as well. He married Winnifred Finn. "I don't know how the two Biggins families are related, but family legend says they are." Jack Biggins 1906-1995 married 1943 Mary O'Rourke. Son is Patrick Biggins of Hayfield, north of Ballinrobe. In September 2016, Anton O'Faolain" sent me an email about his Biggins family from County Mayo. "My mother was a Biggins. She was born on a farm near The round tower of Turlough, County Mayo, not far from Castlebar. She was the second youngest of five girls and was born in 1916. She's been with her Saviour twenty years. Her father, James, died of pneumonia when he was 30. Rumour has it he was shot by the British for being IRA. Who knows. His wife, Moriah, was left to look after the five girls. Mum was only 3 and and the youngest was only a baby. The older girls all went to America, married and have raised families. One of my cousins whom I have not met but several of my siblings have was a teacher at Sandy Hooks Elementary School for years and had only recently left the school before the tragedy. My mother never saw her sisters again. My sisters tracked our cousins down but mum died before they could meet. My mother moved to a southern borough suburb of Dublin called Dun Laoghaire. There she met and married Tom Whelan and had eight children. Tom took his family to Australia where we have done alright. I'm nearing retirement age myself and haver raised eight children of my own. I'm about to write a series of true stories about the amazing Nora Biggins. She was wise, courageous and a wonderful mother with a great faith. "It's a work in progress and the Nora Biggins stories are coming." The history of Mayo begins with the Synod of Whitby in 664, to resolve the conflict between the Celts and the Romans on the date of Easter. Having lost the debate St Colman left Lindisfarne and returned to Iona, later going to Innisboffin and from there to Maigh Eo, later to become known as Mayo of the Saxons. On my 2006 Trip to Ballinrobe, I visited the Ballinrobe library and found a five-volume history of Co. Mayo that mentioned a Fr. James Biggins at Mayo Abbey. After seeing the mention of Fr. Biggins in the Mayo history, I drove to Mayo Abbey. A Castlebar library patron kindly escorted me to the Mayo Abbey road. Mayo Abbey is a small town where the ruins of the old abbey are. St. Colman founded a monastery there in 668 A.D. The abbey was regarded as a center of learning equal to that of Kells and Augsburg in Germany. In 1152, it became the seat of the Diocese of Mayo. In the 16th century, the diocese gave its name to Co. Mayo. In 1631, the seat of the diocese was changed to Tuam. The parish church in Mayo Abbey is St. Colman's Church. Kathleen Delaney wrote in response to a telephone call that Fr. Biggins was born in Castlebar in 1872 to Denis and Mary Biggins. He was baptized on December 24. His mother was from the Killeen family in Claremorris. He was ordained at Maynooth in June 1898. In 1896 St Patrick's College Maynooth had attained the status of a Pontifical University for its courses in Theology, Philosophy and Canon Law. At one time, Maynooth was the largest seminary in the world. In the 1901 census for England, there was a Roman Catholic priest named James Biggins in Birkenhead. He was age 28 and born in Ireland. Birkenhead is in Merseyside, across the River Mersey from Liverpool. Birkenhead is part of the Roman Catholic Diocese of Shrewsbury and has four parishes today. See English Records of Irish Born. Fr. Biggins became the Parish Priest (Pastor) at Mayo Abbey in 1931, having come from Castlebar. At Mayo Abbey, Fr. Biggins renovated the church interior, put down a boarded floor, studded the walls, and painted the inside. He built the curate's residence. An unassuming man, he was well liked by the people. For some years before his death he suffered from heart trouble. He died February 8, 1950, aged 77 years, and is buried in the New Cemetery where the tombstone to his memory was erected by the parishioners. Sister Teresa Biggins is a member of The Sisters of St. John of God in Ballarat, Victoria, Australia. 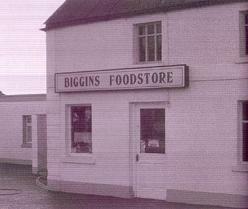 Biggins Foodstore across from Glencorrib Church, 1947-1996. Source: Glencorrib National Schools, 1854-2004. In December 2006, I received a Christmas card from Michael and Bridie Biggins from Ballynalty, whom I had visited on my 2006 Trip to Ballinrobe. Included with the card was Glencorrib National Schools, 1854-2004, a book published in 2004 celebrating the 150th anniversary of the Glencorrib National Schools. Included in the book is an article about the Biggins Foodstore, which was situated directly across from the Glencorrib Church from 1947 to 1996. It was owned and operated by the Michael (Mick) Biggins (1909-1986) and Bridgie Diskin Biggins family. Initially, they sold ciarettes, papers, and general groceries, but over the years the store became more of a general store selling drugs, clothing, and hardware. Mick and Bridgie had seven children who eventually helped out in the store: Michael, Mary, John, Bernadette, James, Bridget, and Patrick. On my 2006 Trip to Ballinrobe, Monsignor Thomas Shannon, of St. Mary's Church in Ballinrobe, provided a list of 27 Biggins baptisms. He had no record of Biggins marriages. Based on baptisms in the 1870s and 1880s, it was possible to reconstruct five Biggins families from St. Mary's Church in Ballinrobe. Based on baptisms in the 1910s, it was possible to reconstruct one other Biggins family from St. Mary's Church in Ballinrobe, first cousins Thomas and Mary Biggins. This family appears above under "Biggins from The Neale and Ballynalty." The father is a son of John and Ellen Rochford Biggins. The mother is the daughter of Patrick and Honor Thornton Biggins. Biggin in Ballinrobe in 1782. On my 2006 Trip to Ballinrobe, I spotted a stone sign embedded in the wall of a house saying "This House Built By Thomas Biggin - 1782." The sign was on a building just after you turn on the Ballyglass Road heading north out of Ballinrobe. On my return trip to Ballinrobe in 2009, I talked to Tom Watson, who lives across the street from the sign. He said the row of buildings where the sign was were built by the Courtney Kenny family. The Kenny family had lived in the Ballinrobe area since the late 17th century and owned a brewery and flour mill there. The theory is that Thomas Biggin was a journeyman stone mason and chiseled the sign into the side of the building during construction. It was plastered over but uncovered when the plaster was redone in 2004. The former Kenny home, Robe Villa, is on High Street, around the corner from the Biggin sign. 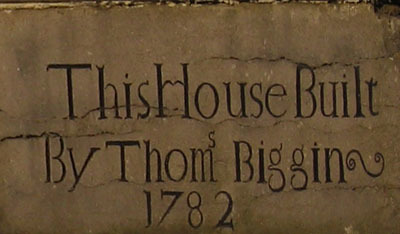 Stone sign on Kenny building, 2006: "This House Built By Thomas Biggin - 1782." Kenny buildings on the road to Ballyglass, with High Street to the right, 2009. The Biggin sign is on the building just to the left of the road signs that appear in the foreground. The ruins of the Kenny flour mill on the Robe River are in back of these buildings. The Kenny home, Villa Robe, is at the far right edge of the photo. Walking down the street in the middle of the picture is Tom Watson, perhaps on his way to lunch, not long after our conversation. See Maggie Land Blanck's Web site for some great 2004 photos of the buildings above when they were being refurbished, as well as the Kenny home and flour mill and other places in Ballinrobe, and old photos of Ballinrobe. 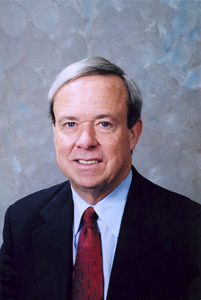 Bob Biggins was the representative from the 41st District to the Illinois General Assembly from 1993 to 2011. Committee assignments included Aging; Tollway Oversight; Mass Transit; Sales and Other Taxes; Executive; Revenue & Finance; Appropriations-General Service. He was born in 1946 in Oak Park, Illinois, and now lives in Elmhurst, Illinois. His great great grandparents were John and Mary Moghan Biggins of Rossdaff, County Mayo, Ireland. Their son, James E. Biggins, was born in 1841 and immigrated to Maine in 1855. He married Mary Nolan and moved to the west side of Chicago in 1872-73. 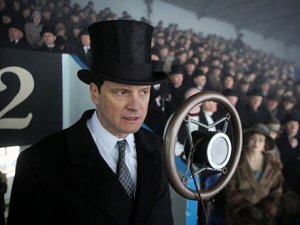 The King's Speech, Momentum Pictures, U.K. Best Picture winner of 2010. Includes 1500 inflatables. 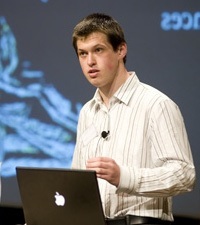 Joe Biggins started The Inflatable Crowd Company in 2002. Since then, his Inflatable Crowds have been seen (but not noticed) in over 80 feature films and many TV shows and commercials. Movies include Seabiscuit, Best Picture nominee of 2003, and The King's Speech, Best Picture winner of 2010. Says Joe, "texture is the key to making inflatables a realistic solution. We provide an unparalleled level of detail customized to match the look of your crowd including everything necessary to blend the inflatables seamlessly among the real, non inflatable extras: real clothing, individual 3D faces, wigs, hats." See various images. New York Times obituary for John C. Biggins, September 19, 1971. In 1946, banker John C. Biggins (1910-1971) introduced the first bank card, “Charg-It,” into his Brooklyn neighborhood. Whenever a customer charged a purchase at a local merchant, the charge was forwarded to Biggins’ bank, which reimbursed the merchant and retrieved payment from the customer. It was a relatively simple transaction, as all Charg-It cardholders were also account holders at Biggins’ bank.According to MasterCard's History of the Card Payments System, since their inception in 1946, payment cards have become a global force - the fastest, most secure, most convenient and most cost-effective method of payment in the world. On pages 146-147 of his 2011 book (Princeton University Press), Debtor Nation: The History of America in Red Ink, Louis Hyman says that Charg-It was created by John C. Biggins while working at his father's small Flatbush National Bank. Shortly thereafter, his father sold the bank to the large Manufacturers Trust Co., which shut the program down. Biggins then joined the Paterson Savings and Trust Company as head of their personl loan department and restarted the Charg-It program. Here the program was successful, and John C. Biggins ended up as the bank's president. Louis Hyman is assistant professor in the Labor Relations, Law, and History department at the ILR School of Cornell University. The Flatbush National Bank of Brooklyn was established in 1926. It began as a state bank and eventually became a national bank. It was merged into Manufacturers Trust Company on May 8, 1946. In 1961, Manufacturers Trust merged with Hanover Bank and the combined bank was called Manufacturers Hanover Trust Company (Manny Hanny). Ron Scherer, a former economics reporter for the Christian Science Monitor, is writing a book that touches upon the invention of the credit card and has done some research at the Brooklyn Public Library. He has learned that John Biggins became president of the Flatbush bank in 1927. Prior to that, John Biggins was president of a manufacturing company. Ron reports that the bank was located at 830 Flatbush Avenue in Brooklyn and is now Fulton Stores (furniture and appliances). John C, Biggins (1910-1971), his father John E. Biggins (b. 1877) and grandfather James Biggins, (b. 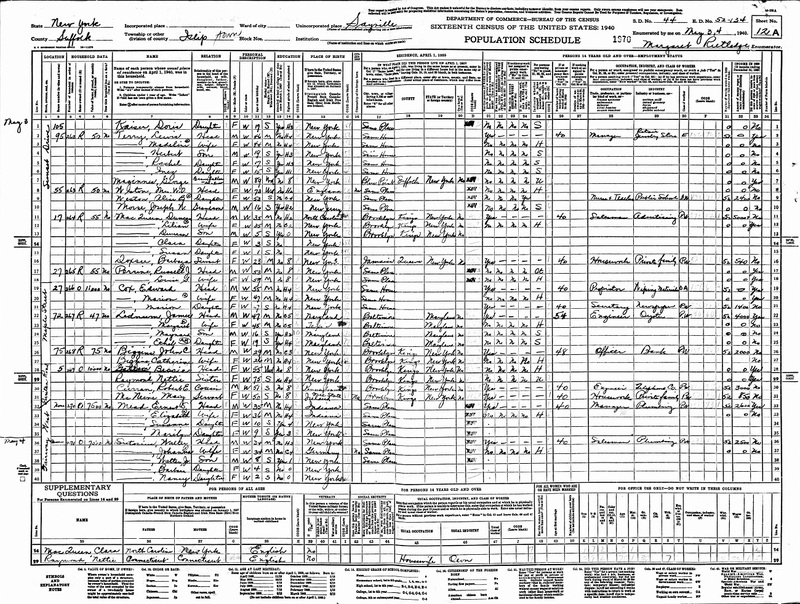 1839) have been found in the U.S. census as follows. 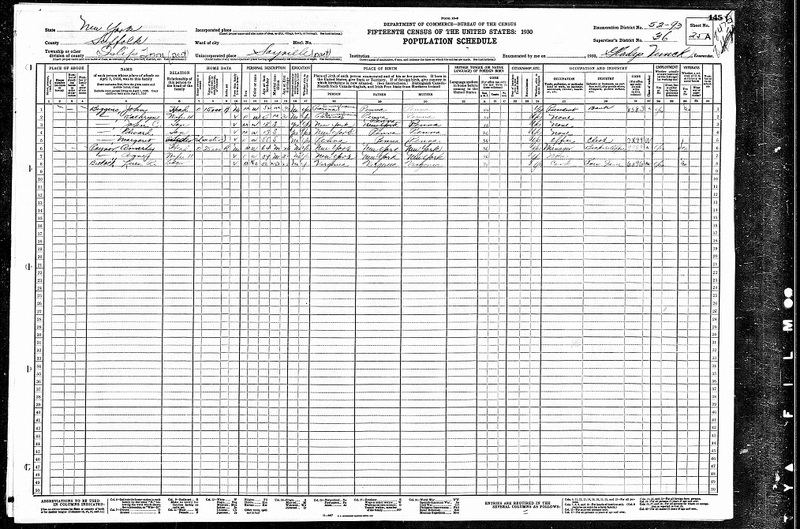 In the 1940 census, John C. and his father John E. lived in separate households. John C. and his brother Edward, 23, were born in New York, but father John E. was born in Pennsylvania. Margaret, 27, was born in Massachusetts. 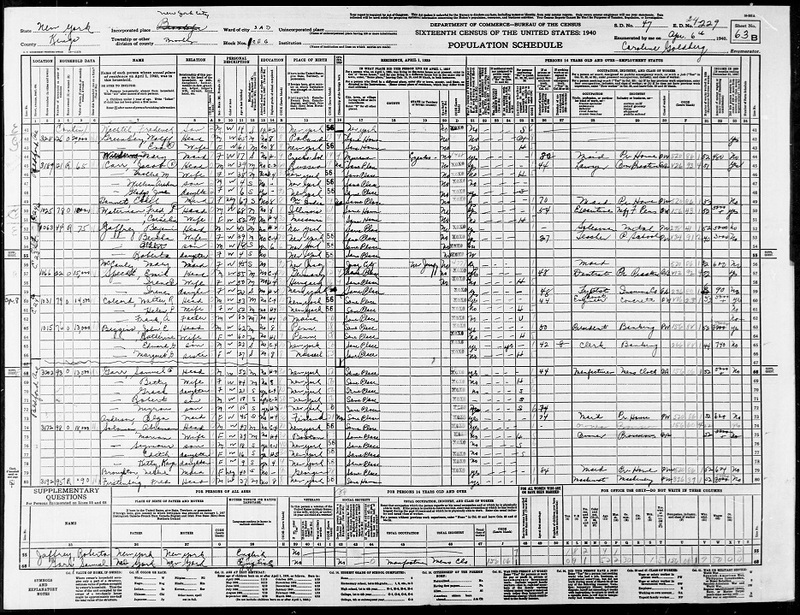 In the 1930 census, the family was counted twice, in a home they owned in Sayville out on Long Island and in a a home they owned in Brooklyn. John C. Biggins is most likely related to the Biggins family from Cloondaver, County Mayo, Ireland. Brian Biggins of Hermitage, Pennsylvania, sent a letter in 1996 to my son Edward in New York hoping to find the relationship between his family from Eldred, Pennsylavania, and nearby Olean, New York and a Biggins ancestor who lived in Brooklyn, New York. Edward passed this "strange" letter on to me, and Brian and I corresponded by mail. For the first time in my life, I did a little genealogical research. No connection was found between our families, but I received a great introduction to Biggins genealogy. This correspondence with Brian Biggins indicated that Brian's great great grandparents, Patrick and Mary Maloy Biggins, were from Cloondaver. Brian's great grandfather, James Biggins, was born in Cloondaver in 1834, emigrated to Pennsylvania in 1851. 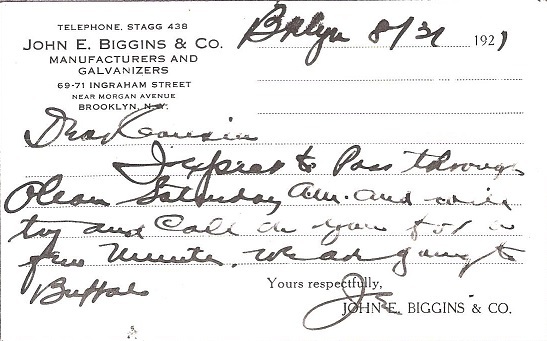 Brian had 1921 correspondence from John E. Biggins, who had a manufacturing, galvanizing, and tinning business in Brooklyn in the 1920s called the John E. Biggins & Co. and located at 69 & 71 Ingram Street in Brooklyn (5 miles from the Flatbush Bank). Brian says that his older aunts and uncles recall that that the New York Biggins family had some connection to the Flatbush National Bank and that some of the family moved to the Boston area. Postcard from John E. Biggins in Brooklyn to his cousin, dated August 31, 1921 (Wednesday). He says he will be passing through Olean, New York, on Saturday. Source: Brian Biggins. 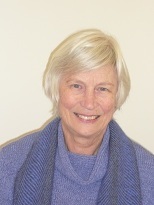 Barbara Biggins OAM, BSc, Grad Dip Lib, is a graduate of the University of Adelaide. She has made a lifetime study of children’s relationship with media. Drawn into the area by observing the potential for both positive and negative impacts on her own 3 children, and informed by her years as Senior Librarian at South Australia's Child and Youth Health service, she has been a longtime advocate for children’s interests, and has served on a range of government Boards related to children and media. She was President of the Australian Council on Children and the Media (1991 – 2003) and currently serves as its volunteer CEO. She received a Medal of the Ordrer of Australia (OAM) for service to the arts, is a Churchill Fellow and was SA’s Senior Australian of the Year in 2004. David J. Biggins is the author of three books on the Anglo Boer War, which took place from 1899 to 1902. Also, he has built a website that makes available information on the Anglo Boer War and provides a forum for discussion of the many aspects of this conflict. The website is at: AngloBoerWar.com. The site is free to use and has grown over the years since it was started by David and his brother Chris in 2004. It currently consists of over 2,500 articles, in excess of 11,000 images and more than 12,500 pages in searchable PDF format. David Biggins of Surrey, England, has spent most of his life as a geologist looking for and producing oil, mainly in the North Sea. But he also has a passion for old cars. He owns a 1913 Nazzaro Corza Targa Florio, which he purchased in 2005. It is one of three Nazzaro cars still in existence. David bought his Nazzaro from a recently closed Italian collection/museum. Felice Nazzaro (1881-1940) won the 979 km Targa Florio race in 1913 driving a Nazzaro Tipo 2. 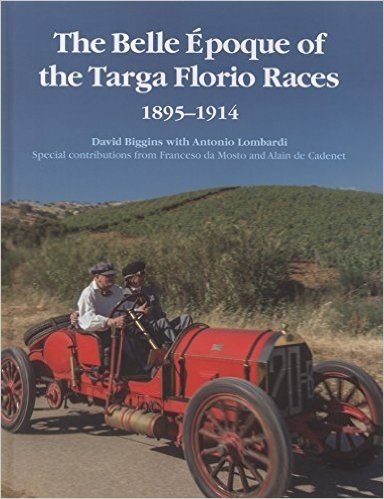 David wrote a book about the Targa Florio with Antonio Lombardi: The Belle Époque of the Targa Florio Races. The book released by Upfolds Publishing in December 2013 a prelude to the film released in 2015. The book is a hard covered coffee table style in high definition. 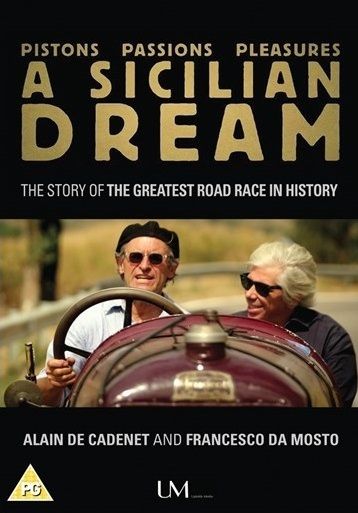 David produced a movie about the Targa Florio with Alain de Cadenet and Francesco da Mosto: Pistons, Passions, Pleasures - A Sicilian Dream. The film premiered on November 2015, at the Prince Charles Theater in Leicester Square, London. David's Y-chromosome DNA is kit No. 125892 in the Biggins DNA project at Family Tree DNA. His DNA is classified as Niall of the Nine Hostages--also called Northwest Irish. There are two others in the Biggins project with similar DNA. They are from County Mayo in Ireland. There are eight other people in the Biggins project with a duifferent DNAcalled DNA of the Three Collas. They are from the Ulster area of Ireland, which is where the Collas originated. David's ancestor, Henry Biggins, was born in Yorkshire in 1859. The 1851 UK census for Yorkshire includes 200 people named Biggins. Only one was born in Ireland. Only four are named Henry, including the one born in Ireland. He was age 30 and worked as a cutler. The 1851 UK census for Yorkshire also includes 148 people named Biggin. None was born in Ireland. Only 11 are named Henry. David is the uncle of Sue Biggins below. 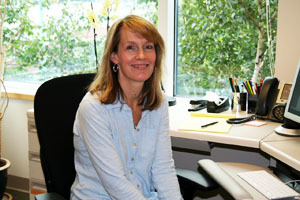 Sue Biggins, Principal Investigator, Biggins Lab, Fred Hutchinson Cancer Research Center, Seattle, Washington, USA. Sue Biggins, a molecular biologist from Princeton University, heads up the Biggins Lab at the Fred Hutchinson Cancer Research Center in Seattle. She has a B.S. from Stanford University and a Ph.D. from Princeton University. The Biggins Lab is studying how cells get the right chromosomes. Says Sue, "Our goal is to understand the mechanisms that ensure accurate chromosome segregation and thus maintain genomic stability and prevent human disease. This work is critical not only for elucidating fundamental aspects of this essential biological process, but is also required for the design of better therapeutic interventions in the long-term." In 2015, Dr. Sue Biggins was elected to the National Academy of Sciences, one of the country’s highest scientific honors (akin to a Baseball Hall of Fame for science). Sue Biggins is a niece of David Biggins above. Christopher Biggins was born in 1948 in Oldham, Lancashire, and brought up in Salisbury, Wiltshire. He is a British actor well recognised on British television. A comedy actor, he was also a regular character in the popular situation comedy Porridge. Other comedy shows he appeared in include Whatever Happened to the Likely Lads? (1973), Some Mothers Do 'Ave 'Em (1973 & 1978), Brendon Chase (1980) and a regular role in the children's television programme Rentaghost (1978-1983) as Adam Painting. He is more versatile than many people assume: he played Nero in the acclaimed BBC dramatisation of I, Claudius by Robert Graves, and also appeared in the BBC's famed adaptation of Poldark. He also appeared in the Big Finish Productions audio drama The One Doctor, based on the television series Doctor Who. His film roles include The Rocky Horror Picture Show (1975), and he is also known in the theatre; for example, he has recently appeared in the stage adaptation of Chitty Chitty Bang Bang. He was co-host on Surprise, Surprise and hosted children's quiz On Safari (TV) in the 1980s. In his 2008 autobiography Just Biggins - My Story he speaks about his Lancashire roots. 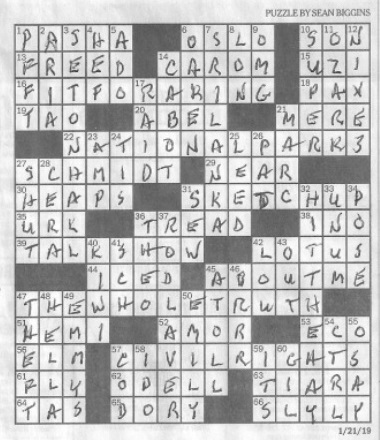 New York Times Crossword constructed by Sean Biggins, completed by Peter Biggins. Original with clues. I was drinking coffee and doing the Times Crossword one day after breakfast. I glanced up to see the name of the constructor at the top of the grid. Imagine my surprise to see that he was a Biggins. It was Monday, January 21, 2019, the birthday of Martin Luther King Jr. I had been working these crosswords for a long time and had never seen one constructed by a Biggins. 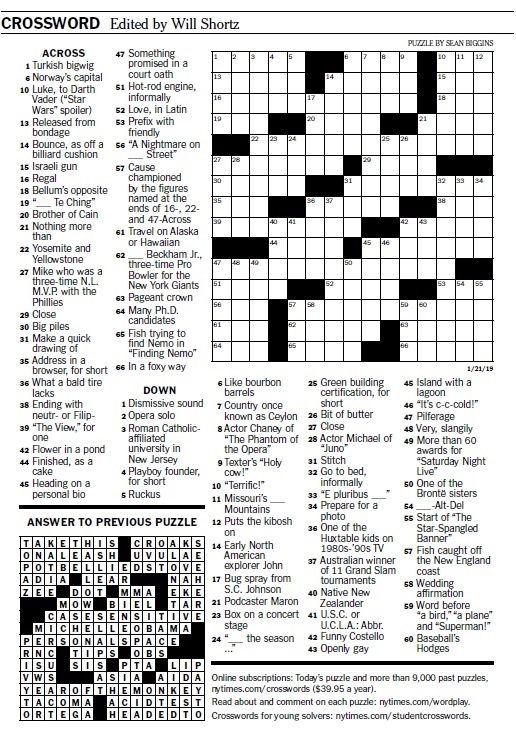 An Internet search told me this was the first Crossword done by Sean Biggins, so it was probably the first by a Biggins. I became interested in crosswords after trying to solve some with my wife's grandmother (shout out to Grandma Pat in Algona, Iowa!). When visiting her, we would sit around the kitchen table, drink coffee, and (try to) solve the crossword. Once I got the hang of solving, I felt that constructing would be a fun challenge. Thanks to Will and Sam for coaching me through a few revisions of this puzzle and teaching me a lot along the way. The idea for this puzzle was born out of a political theme I was trying to pull together. I was looking at last names of politicians that were homonyms (Bush, Gore, May, etc.) when I came to Martin Luther King Jr's name and reflected on "King" as part of a potential theme answer. I realized there were other prominent civil rights leaders whose last names shared the same characteristic. Sojourner Truth and Rosa Parks quickly followed. I hope solvers enjoy the theme and find it fitting for the day. We owe a large debt to the civil rights leaders of the past, and I hope this puzzle serves as a reminder that there is more progress to be made. Kieran at High Biggins Old Hall in Kirby Lonsdale Parish, South Lakeland District, Cumbria, England. Kieran is pointing to the sign denoting the path that winds down the hill to the village of Low Biggins. High Biggins is a small town about one mile southwest of in Kirby Lonsdale in Cumbria, England. Kieran Biggins, a DNA tester from County Monaghan and Scotland, and his son Gerard visited the village of High Biggins in Cumbria, North England in 2004. He wrote the following about the trip in 2017. As a child growing up in Scotland, we were always aware of this village when on our many road trips “down South” to visit family in Manchester. Dad would always point out the A65 turnoff which he knew led to the market town of Kirkby Lonsdale and the adjacent villages of High and Low Biggins. We knew nothing of how the villages got their names or if there was any connection to our family name. 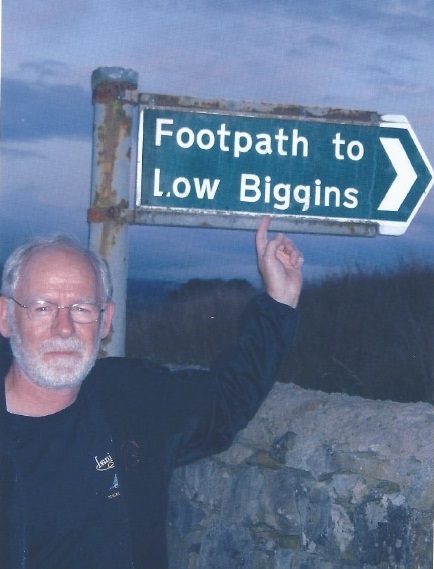 During our 2004 trip, after reaching Kirkby Lonsdale, we followed the signs for “Biggins” and arrived in the village of High Biggins mid-afternoon after a casual drive across the Yorkshire Dales. We parked the car and set about wandering the lanes of the village. Needless to say we found “Biggins Lane” and spotted the footpath to the village of “Low Biggins” which we decided not to follow due to time constraints. 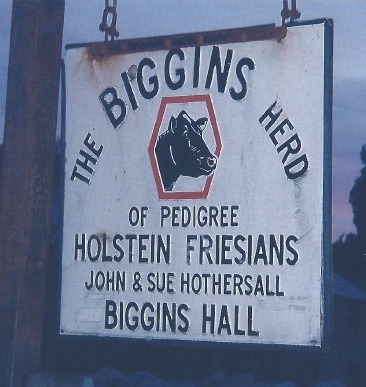 Further down the lane was the sign for “The Biggins Herd” of Pedigree Holstein Friesen cattle owned by John and Sue Hothersall of “Biggins Hall”. At the “Biggins Lodge Farm” we noted a gentleman unloading groceries from his car and as the chatty Scotsman I am, asked him if he knew anything of the history of his house or the village that shared my surname. He indicated that he knew little, having only moved into the house a few months earlier after his retirement from teaching. He did, however, take us outside to show us the high wall at the end of his garden that at one time represented the perimeter of the “Biggins Mansion” that had been demolished a long time ago. In addition, he pointed out the Biggins Crest that had been incorporated into one of the village walls around the corner from his house. This crest is believed to be the only known remnant of the existence of the Mansion. 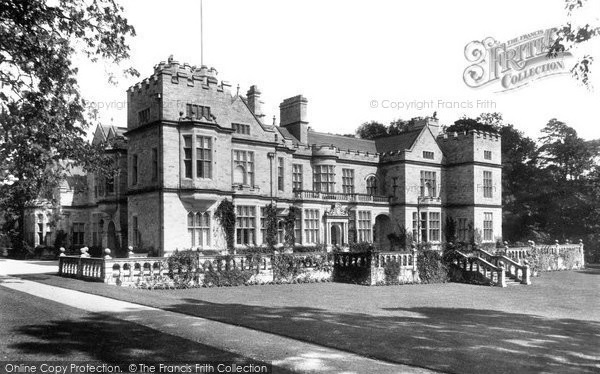 “The Biggins” as the mansion was formally known, was built in 1895 by a Dr. Paget-Tomlinson of Kirkby Lonsdale. The only known photographs of the mansion were taken in 1899 but it was demolished sometime later. It is believed that a “Biggins Estate” was in existence in 1745. Biggins Hall built in 1899 in Kirby Lonsdale Parish, South Lakeland District, Cumbria, England. Source: Francis Firth. 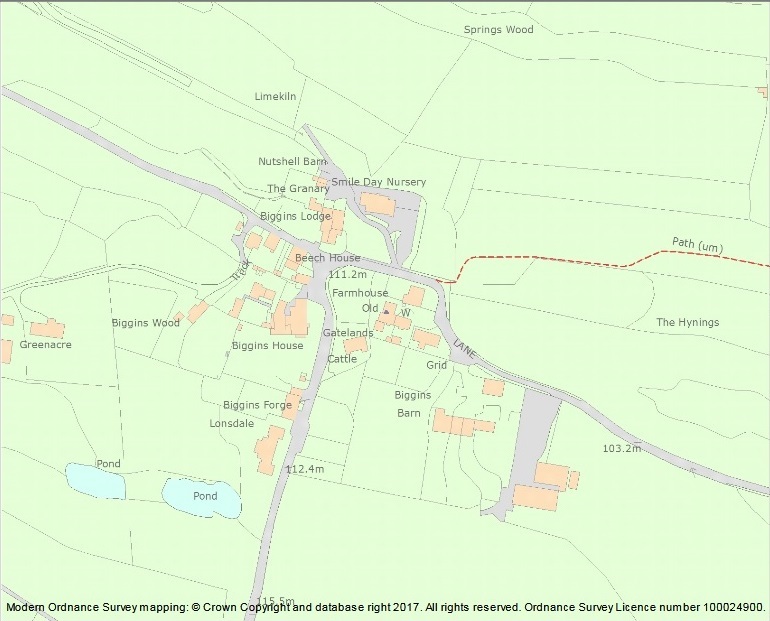 2017 map of High Biggins Old Hall in Kirby Lonsdale Parish, South Lakeland District, Cumbria, England. Source: Historic England. Crest from High Biggins Old Hall in Kirby Lonsdale Parish, South Lakeland District, Cumbria, England. 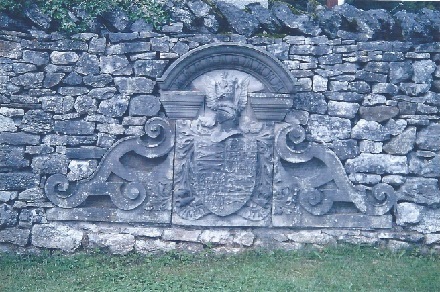 The crest was recovered from the demolished mansion and has now been incorporated in one of the village walls. Source: Kieran Biggins. Sign for cattle at High Biggins Old Hall in Kirby Lonsdale Parish, South Lakeland District, Cumbria, England. Source: Kieran Biggins. Biggins is a small town in Derbyshire, England, about 5 miles south southwest of of Ashbourne and 10 miles northwest of Derby. Biggins is also a small town in Derbyshire, England, near Hartington, called sometimes Biggin-by-Hartington. There is an historic house of 17th century origin, Biggin Hall, which is a now a hotel and restaurant. Biggin is a small town in North Yorkshire, England, about 13 miles south southwest of the city of York and 18 miles east of Leeds. Biggin is a farming community a mile east of Little Fenton. The road between Biggin and Little Fenton is called Biggin Lane. Little Fenton is about a mile south of Church Fenton. 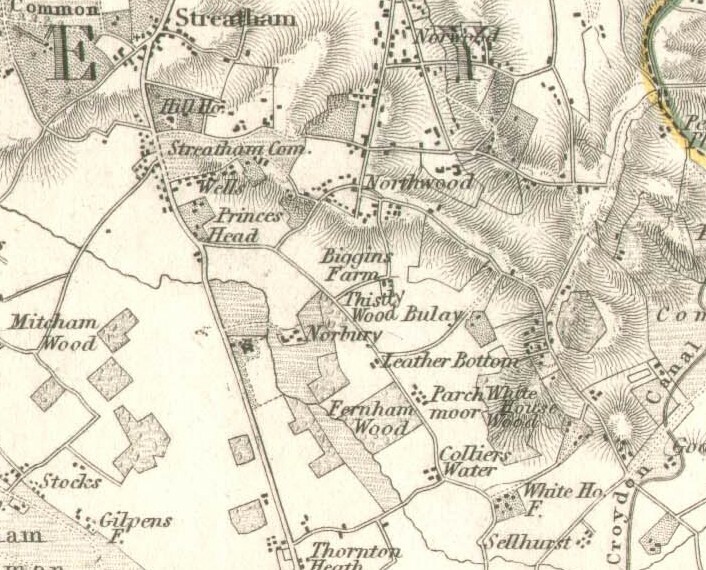 On page 251 of Volume III of Surrey Archaeological Collections, there is a description of Biggin Farm: "A farm of some extent lying at the foot of Norwood hill. The name, in 1584, was bygin farm, and I think may fairly be deduced from Saxon bykan, or byge (whence are drived bay and bight), signifying a corner. The farm is situate in the angle, or corner, between the Selhurst wood and the great North wood." See 1832 map. Now, all that remains of Biggins farm is two streets: Biggin Way and Biggin Hill, in what is now the Borough of Croydon, about 22 minutes south of London. Since 1917, there has been an airfield in Biggin Hill, about 45 minutes southeast of London, in the Borough of Bromley. The air station played a major role in World War II, serving as a base for Spitfires and Hurricanes in the Battle of Britain. It is featured in Dan Brown's fiction, "The Da Vinci Code." In Collecting The Antiquities Of That Kingdom, the poet Robert Burns (1759-1796) uses the word biggin in referring to an old, owl-haunted dwelling (italics added). I think they call it. And Then ye'll see him! Now, by the Pow'rs o' verse and prose! Wad say, "Shame fa' thee!" 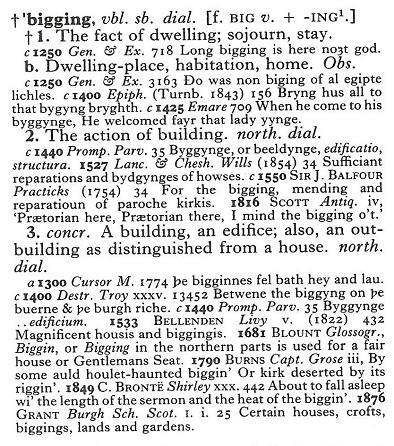 The name Biggin appears in dictionaries of English names. BIGGIN. A common termination of local names, especially in the North. It means a building of considerable size — a house, as opposed to a cottage. A-Sax. byggan to build. Biggin, Biggins: Thomas del Biggyng 1391 FrY[Register of the Freemen of the City of York (Surtees Soc. 96, 102, 1897, 1899]; William atte Byggyngge 1397 PN C[Place-Names of (e.g. PN Bk, Place-Names of Buckinghamshire, &c. English Place-Name Society)] 191, ME bigging 'dwelling-place, home', used also of an outbuilding as distinct from a house. According to "The Coffee Bean Queen," in 1780, Mr. Biggin became the revolution of the coffee world. Who is Mr. Biggin? Well, it is not a who, but rather, a what. Mr. Biggin was a coffeepot built with a filter, shaped like a tea cosy, which sat inside the pot. It was originally called “bagging” and it has been reported that the name “Mr. Biggin” allegedly came about because of the poor use of English. It was shaped like a tall, oval teapot with a spout at the bottom. Biggin Manor House, now called The Priory, Cosgrove, Milton Keynes, Buckinghamshire, United Kingdom. 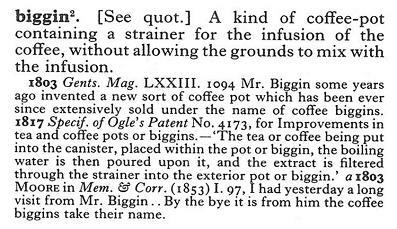 According to All About Coffee, written in 1922 by William Harrison Ukers for the Tea and Coffee Trade Journal Company, "the coffee biggin, said to have been invented by a Mr. Biggin, came into common use in England for making coffee about 1817. It was usually an earthenware pot. At first it had in the upper part a metal strainer like the French drip pots. Suspended from the rim in later models there was a flannel or muslin bag to hold the ground coffee, through which the boiling water was poured, the bag serving as a filter. 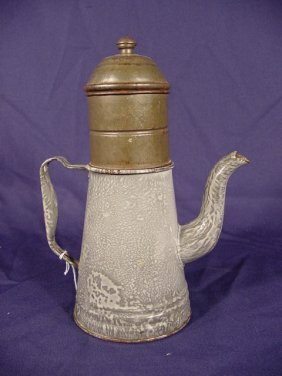 The idea was an adaptation of the French fustian infusion bag of 1711, and of other early French drip and filtration devices, and it attained great popularity. Any coffee pot with such a bag fitted into its mouth came to be spoken of as a coffee biggin. Later, there was evolved the metal pot with a wire strainer substituted for the cloth bag. The coffee biggin still retains its popularity in England." The inventor of a forerunner of the percolator coffee pot was George Biggin, 1755-1808, who lived in Cosgrove, between Northamptonshire and Buckinghamshire in southeast England. Cosgrove is 44 miles northeast of Oxford and is now part of a new town called Milton Keynes. George Biggin was a successful scientist of the time and close friend of the Duke of Bedford. 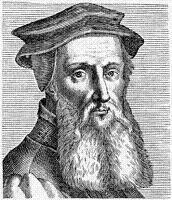 He developed new techniques in the tanning process and was the inventor of the Coffee - Biggin, a coffee filter system which was a forerunner to the percolator. The Biggin Manor House in Cosgrove was built in the 17th century by the Rigby family. It became known as the Priory around 1810 and is now the UK headquarters of Pericom Plc. Wendy Page has done research on George Biggin. Wendy is currently trying to prove a link between George's father John and a John Biggin who was a major trading merchant from 1786. The Oxford English Dictionary claims that this device was named after a "Mr. Biggin." Some sources surmise that the name came from the Dutch "beggelin", meaning to trickle. Confusingly, certain French coffeemakers are labeled as Biggins. These devices are essentially drip pots, whereas to be labeled a Biggin, the device must operate by the steeping method: holding the coffee and water together, then isolating the spent grounds after the period concludes. Against these obstacles, the lame foreigner with the stick had to make head as well as he could; not absolutely single-handed, because Mr Arthur Clennam had recommended him to the Plornishes (he lived at the top of the same house), but still at heavy odds. However, the Bleeding Hearts were kind hearts; and when they saw the little fellow cheerily limping about with a good-humoured face, doing no harm, drawing no knives, committing no outrageous immoralities, living chiefly on farinaceous and milk diet, and playing with Mrs Plornish's children of an evening, they began to think that although he could never hope to be an Englishman, still it would be hard to visit that affliction on his head. They began to accommodate themselves to his level, calling him 'Mr Baptist,' but treating him like a baby, and laughing immoderately at his lively gestures and his childish English--more, because he didn't mind it, and laughed too. They spoke to him in very loud voices as if he were stone deaf. They constructed sentences, by way of teaching him the language in its purity, such as were addressed by the savages to Captain Cook, or by Friday to Robinson Crusoe. Mrs Plornish was particularly ingenious in this art; and attained so much celebrity for saying 'Me ope you leg well soon,' that it was considered in the Yard but a very short remove indeed from speaking Italian. Even Mrs Plornish herself began to think that she had a natural call towards that language. As he became more popular, household objects were brought into requisition for his instruction in a copious vocabulary; and whenever he appeared in the Yard ladies would fly out at their doors crying 'Mr Baptist--tea-pot!' 'Mr Baptist--dust-pan!' 'Mr Baptist--flour-dredger!' 'Mr Baptist--coffee-biggin!' At the same time exhibiting those articles, and penetrating him with a sense of the appalling difficulties of the Anglo-Saxon tongue. The Biggin Cap (also called a "coif" or "arming cap") was worn by all classes, ages, and sexes. It can be worn alone or under a straw hat, a flat cap or a helmet. A biggins cap kept the wearers hair in place. It has a cord sewn in to tie at the throat. 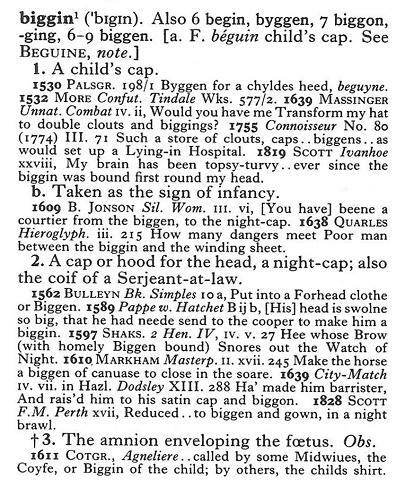 It was called earlier a begin or biggen and got its name because it was the "beginning" cap placed on infants. 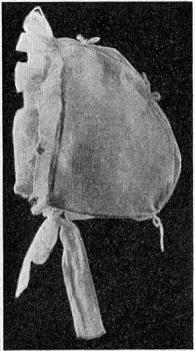 Infant biggin from Two Centuries of Costume in America, Vol. 1 (1620-1820), by Alice Morse Earle. Biggin under flat cap from Two Centuries of Costume in America, Vol. 1 (1620-1820), by Alice Morse Earle. In act IV, scene 5 of Part 2 of Shakespeare's Henry IV, written in 1597, Prince Henry has a soliloquy where he mentions his sleeping father's homely biggen (italics added). Presencia-Biggins, Keel Court, Enterprise Close, Medway City Estate, Rochester, Kent, UK. The Biggins Lace Company, which is now Presencia-Biggins, sells lace patterns, craft threads, and other lace-making equipment and supplies. They are located in Rochester, Kent, United Kingdom. Wings was an American sitcom that ran on NBC from April 19, 1990 to May 14, 1997. The show was set at a small airport on the island of Nantucket, Massachusetts, where Joe Hackett operated Sandpiper Airlines. Roy Biggins (played by David Schramm) was the owner of Aeromass, the only other airline on Nantucket. Generally competitive, arrogant and unpleasant, Roy often belittles Joe for having a small-time operation, mocks Joe's business skills, and generally implies by his comments that Joe is inferior to him altogether. Despite this, Roy obviously feels threatened by Joe's presence as a competitor, and makes numerous attempts to either buy Sandpiper or put them out of business. Roy was married once to a woman named Sylvia; for several years he claimed that she died, but it was later revealed that she had actually left him, and is now living in Boston and married to a wealthy plastic surgeon. The couple have one son, R.J. (Roy Junior), who is gay. 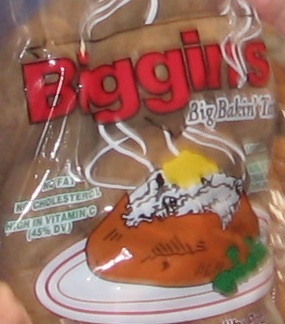 20-pound bag of Biggins baking potatoes, extra large, $8.49, at Costco in Norwalk, Connecticut, 2010. 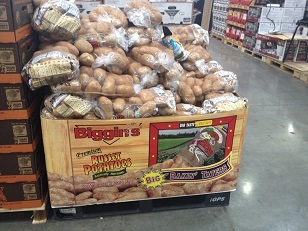 Biggins baking potatoes, at Costco in Norwalk, Connecticut, 2014. Photo by Brendan Biggins. According to Rachel Leach, marketing manager of Russet Potato Exchange in Bancroft, Wisconsin, the name Biggins has been used as a trade name for their baked potatoes since 1998. The name was adopted because their potatoes are big--twice the size of the average potato. "This is Biggins Country, where the potatoes are big, hearty, and full-flavored, and they’re not afraid to stand up for what they believe in; the right to a thick, juicy steak, the right to a big dollop of sour cream, and the right to unlimited trips to the salad bar." In May 2014, the website had this to say about the Biggins product: "The Biggins® brand offers a full range of russet potatoes, sweet potatoes and jumbo onions. Biggins® products are big, hearty and full-flavored. It’s a “special” occasion product for all occasions—whether it’s a table for one or a table for 10." Chef Robert "Biggins" Hesse, was a season five contestant (2008-09) on the Fox reality TV cooking series, "Hell's Kitchen." His nickname is "Biggins," perhaps because he weighs close to 400 pounds. After the show, Hesse worked as a chef in the New York Yankees locker room. On Memorial Day weekend 2009, he opened a new restaurant with a fellow "Hell's Kitchen" contestant called Georgica in the Hamptons on Long Island. In December 2009, he became the chef at newly reopened Catamaran's Restaurant on Solomons Island in southern Maryland, transforming the former lounge into a restaurant providing homemade dishes. 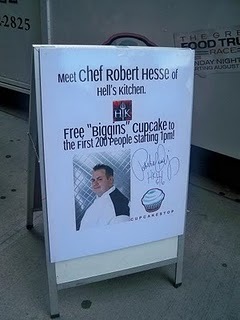 In September 2010, he created the "Biggins" cupcake for The Cupcake Stop. Hesse, from Quogue, Long Island, is a graduate of the American Culinary Academy in Lakeland, Florida.